If you've been looking for discount MTD snow blower parts, then you've come to the right place. Welcome to the Replacement Commercial Parts Warehouse, where we have more than 1.2 million parts available online, which means that we'll always have what you need. 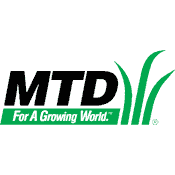 We offer huge discounts compared to retail pricing, which means you can save big when buying MTD parts for your lawn mower, tractor, or snowblower online from our store. We carry genuine MTD snowblower parts as well as aftermarket MTD parts so you can get back to mowing, blowing, or cruising around, and you'll always find a great deal. Not sure what you're looking for? Browse all genuine MTD parts here. Below, you can enter your specific part number or model number to get started with your search, or browse by the type of part you need. Or simply call us directly at 800.937.7279 today and we'll help you find the exact MTD snow blower parts or other equipment that you need.